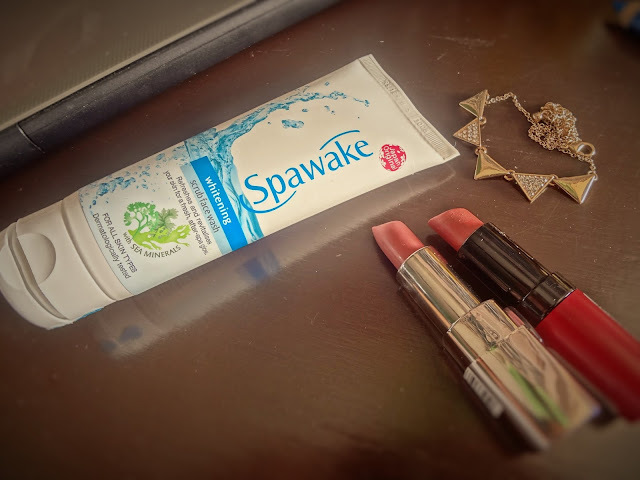 Spawake is originally a Japanese brand and Japanese skin care products are actually to die for. Lately, I felt the need of a mild scrub. I have used Everyuth scrubs and they really aren’t meant for my acne prone skin. A little advice, when you’ve got acne then you shouldn’t scrub your face as the particles inside it cause irritation to acne. There are days when my skin gets clearer so I wanted the scrub for those days. On seeing Spawake Whitening Scrub Face wash, I thought let’s not take a too risky step of really investing into a scrub when it only accentuates my acne and flaws. So this seemed a better bet. This face wash retails for INR 129. The content inside the plastic flip top tube is transparent base with minute brown granules into it which aren’t really hard like those in Everyuth Walnut Face scrub. The fragrance of the face wash is unrecognizable and not really sweet or fruity. Initially I took a small dollop of the product but it seemed insufficient as no lather was formed. I took more, and still the same effect. I tried scrubbing all my facial skin and post washing, I felt no refreshing sensation, neither saw any black or white heads lessening. In short, coming up with the ideas of creating a 2 in 1 product terribly failed as it catered to needs of none. I actually had high expectation out of this brand due to earlier experiences but this one product did not stand up to my liking. Post face wash my skin wasn’t soft either, nor squeaky clean.